The Class of 2009 with faculty and staff. 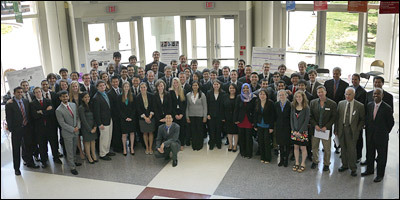 Bioengineering seniors presented their final projects at the Capstone II finale, held May 13, 2009. Teams presented the results of two semesters of research and testing, outlined challenges and successes, and demonstrated their prototypes. This year the event held a special significance, as our seniors represented the first full graduating class of bioengineering majors. 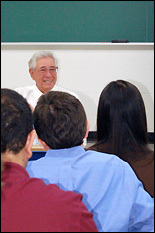 This year, Mrs. Susan Fischell, spouse of department benefactor Dr. Robert E. Fischell, proposed, sponsored and inaugurated a new aspect of the Capstone experience: Each year the top three project teams, as selected by a panel of judges, will now win monetary prizes donated by Mrs. Fischell, and will also be invited to present their work to the public at the Fischell Festival. The teams may also have the opportunity to have their inventions put on track for development at the new Robert E. Fischell Institute for Biomedical Devices. 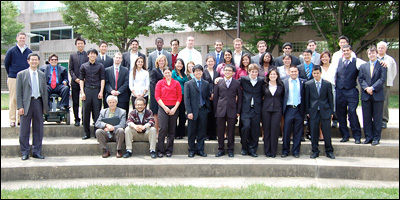 Winners of the 2009 Capstone awards are noted in the project descriptions below. Our seniors would like to thank their professors and mentors (listed with their Capstone teams below); lab staff including Melvin Hill, Ali Jamshidi, and Gary Seibel for guidance, time, and labor; administrative staff members for help with financial support and purchasing; Professor and Fischell Department of Bioengineering Chair William Bentley; and friends in outside academia and industry for the advice and supplies they donated that helped these projects succeed. Head injuries sustained while playing sports, from a fall during a seizure, and from compulsive self-injurious behavior by people with autism are often either unnoticed or misdiagnosed in their severity. 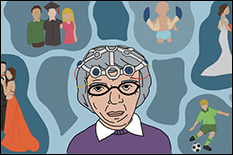 Using ideas outlined in a 1984 patent by Dr. Robert E. Fischell, Team 1 designed a comfortable, sensor-lined hat capable of wirelessly transmitting alerts and impact data to caregivers or coaches, and to signal-processing software (also designed by the team) capable of analyzing whether or not a head injury requires more substantial medical attention. The sensors used are made of a piezoelectric material which, when deformed by an impact, generate a voltage that becomes the transmitted signal. If the force of an impact exceeds a certain threshold, an alarm is issued. A collection of signals can be saved over time, allowing doctors to review the times, locations and intensities of the impacts. Although the prototype demonstrated was in the form of a baseball cap, the team explained that the system could be built into any kind of close-fitting hat, helmet, or headgear. Sleep apnea, a condition in which a person temporarily stops breathing while asleep, affects millions of people, resulting in poor sleep, headaches, problems with memory and concentration, cardiovascular disease, and even death. There are three types of sleep apnea: obstructive, in which the soft tissue at the rear of the throat collapses, blocking the airway; central, in which the brain stops signaling the sleeper to breathe; and mixed, a combination of both. Team 2 chose to focus on treating obstructive sleep apnea (OSA). Currently, people suffering from OSA may use a CPAP (continuous positive airway pressure) device, which uses a small air compressor and a mask to keep the throat tissues from collapsing. The CPAP is an unpopular and often abandoned solution, because it may cause discomfort or skin irritation and be difficult to adjust and fit. Team 2 designed a soft, pressurized, inflated hood that does not touch the face, gives the wearer more freedom of motion, and features an exhaust port and permeable fabric to maintain safety should the compressor stop working. The hood could be produced for significantly less than the cost of a CPAP system. Five out of six of the group's test users (all of whom have OSA) reported that they would be willing to use it regularly, and all reported an increase in comfort versus the traditional CPAP. Team 3 created a device to assist patients with paresis, a condition in which the movement or functionality of a healthy limb is impaired or weakened following a stroke or a nerve injury. The device, designed to aid in recovery or restore functionality, is similar in concept to a myoelectrically-controlled prosthetic limb: it uses an electrical impulse generated by another muscle in the body to signal the target muscles to contract. A non-invasive sensor is placed on a healthy muscle, while a non-invasive electrode is placed on the problem limb—Team 3's example focused on the hand. When the healthy muscle (in this case the bicep) is flexed, the signal it generates is filtered, sent to a microcontroller, amplified, and carried to the electrode, which stimulates the hand to move. The team's signal processing software is capable of differentiating between large and small movements. The device could be used with a variety of muscle/limb combinations, and is also battery-powered, safe, easy to use, wearable, and economical. Colonoscopes, the instruments used during colonoscopies to examine the patient's colon, are susceptible to looping (especially in the sigmoid area of the colon), which causes them to buckle instead of advance. This results in more discomfort for the patient, longer test times, the need for more anesthesia, and sometimes the inability to complete the procedure. 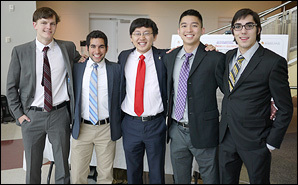 Team 4 designed a double-layered, biocompatible sheath for colonoscopes that uses air pressure to vary and control the stiffness of the device, allowing it to move more easily through the patient, particularly around sharp turns. The sheath is made of a material with high tensile strength that can be sterilized and reused. Many emergency room and hospital patients require heart monitoring using an electrocardiogram (ECG, EKG), the data for which is collected by electrodes placed on the skin. Current products involve a multi-step process using adhesives and solvents to apply and remove them, may unexpectedly detach, leave a residue, and may be painful to remove from the sensitive or damaged skin encountered in newborns and burn victims. Team 5 sought to design an improved product that would have increased adhesive strength, leave less residue, feature and all-in-one design containing both the adhesive and solvent, and be gentler to the patient's skin. Their prototype electrode features a conductive plate, a new hydrogel adhesive they designed, and a bubble-like packet filled solvent, all in a GORE-TEX® package. When the electrode is ready to be removed, a doctor or nurse squeezes the solvent bubble until it ruptures. The solvent breaks down the hydrogel in place and the electrode can then be lifted away. How many times a day do you use a pen? In how many places? And how often is the pen borrowed from someone else, or used by many people who have come before you at the grocery store, the doctor's office, school or work? These small, mundane objects can be covered in bacteria or viruses that are easily spread through hand contact. Anti-microbial pens are uncommon and not very effective, and hand sanitizer may not always be available. Team 6 designed a compact system that can be used to quickly sanitize shared pens, pencils and styluses without the wetness or waste of hand gels and prepackaged wipes. The device takes the form of a stainless steel container that exposes the entire surfaces of writing utensils to a germicidal UV light mounted in its interior that kills a wide variety of bacterial and viruses. For safety, the device features a sealed lid and sensors that indicate when its 30-second cleaning cycle is over and the UV light is off. Team 7 designed a portable device that can be used to quantify the sugar content—and therefore relative sweetness, tartness or ripeness—of a piece of fruit, information which could appeal (no pun intended) to growers, grocers, bakers, shoppers, and even diabetics monitoring their blood sugar. A piece of fruit (this project focused on apples) is placed in a light-sealed "funnel sensor head", which takes the form of a small, padded cone. From below, the fruit is exposed to infrared light which passes through the skin and flesh and is picked up by a sensor. A refractometer—a tool that measures how much the light is bent as it travels, which will vary by the amount of sugar present—in the device is then used to calculate the fruit's Brix number, an industry-standard measurement used to define sweetness. When a patient with kidney disease has toxins filtered from their blood using hemodialysis, an unknown quantity of potassium is also removed. The accidental removal of too much potassium can cause muscle weakness, seizures, arrhythmia, and even sudden death. Team 8 has designed a device capable of real-time monitoring of blood potassium levels, including safety checkpoints and built-in delays to allow for recalibration as potassium levels change. More effective dialysis means fewer lab and technician costs, and a reduction in the time required for treatment. The team hopes to eventually fully automate the device, which would allow it to run while the patient is sleeping, and to make it an add-on component to existing home dialysis products. The G.I. Go is a lightweight, cost-effective device for the therapeutic or rehabilitative treatment of the hand. The patient uses the device by slipping his or her hand into a comfortable glove attached to a series of spring-loaded plastic bars, pushing against them using prescribed finger and hand movements. The resistance is adjustable. The G.I. Go allows the patient to keep his or her fingers straight, achieve 90º rotation (full contraction), and exercise individual fingers, intrinsic (finger) and extrinsic (forearm) muscles, and the whole hand. No products currently available address all of these important physical therapy requirements in a single device.